Jesus The Radical Pastor: The Old Man and the Sea: Christ Metaphors? 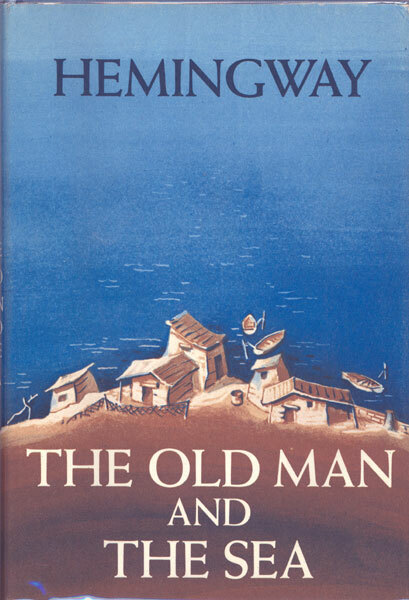 About a month ago, I re-read Earnest Hemingway's The Old Man and the Sea. Hemingway won the 1954 Nobel Prize for Literature with this short novel. I believe that Hemingway purposely included allusions to Christ in his novella. Two clear allusions are: 1) Jesus' wounds: the bleeding hands and face of Christ in the old man's own hands as the ropes cut into them and the old man gets gashed in the cheek when he is yanked to the bottom of the boat by the marlin. And 2, the cross: Jesus carrying his cross as the old man wearily carries, even falling under, the mast of his old boat up the bank of the beach. Google "Old Man and the Sea Christ-figure" and 37,900 web-sites are available on the topic---some who think the Christ allusions were intentional and others who don't see them at all. 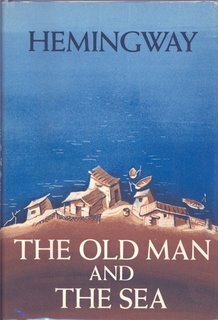 If you are a Hemingway fan and have read Old Man and the Sea, what do you think? I'm a huge fan of this book, and I'm not totally persuaded -- mostly because of what I know of Hemingway's life. But, authors like Hemingway always use classic images and absorb them naturally into their stories. A great book. I didn't see that. But thanks for bringing it up. First time I've heard of it. I knew you were a huge fan of the book and I wondered what you thought. So the images were not intentional, you think? Read it again with the Christ-figure in mind. The images are there. Interesting notion, John. I listened to the book on CD during a trip to Florida and back, last Decemeber. The analogy didn't occur to me at the time. And then the fish would analogize death? Wouldn't there need to be a point to the imagery? Who or what was redeemed by the old man's victory over the fish...besides the old man's own reputation, if that? I don't think anyone can deny the Christ-figure allusions. The question is: did Hemingway purposely intend to communicate something by them? Assuming you agree that they're there, your questions then are pertinent. I do not think Heminagway was trying to communicate anything truly redemptive, unless, like you say, the old man's seemingly failed venture at fishing. I can't claim to be a Hemingway expert, far from it, but my gut tells me it's unintentional. I prefer to think that he would've given it more purpose in the story. Perhaps my friend and Hem biographer, Florida Bob, would have a position on this. I'll send him the URL and see if he pleases to chime in. ...which reminds me: I still need to loan you my copy of his book! It would be great to get FLorida Bob's input on the question. I think that Hemmingways books are doors into his emotions. The books are rather to the point but they are filled with power. The dreams of the old man of the lions. His adoration of Joe Dimaggio......these are not light things. I think in Santiago and the great fish, Hemmingway projects himself onto both of these characters. With Santiago it is the pride of man that sets out to go beyond and what do we bring back. What is the point of the glory of man......in the end we have nothing to show for it as it is all taken away and eaten by sharks. The glory of man is a fickle thing. It does not keep. I think that Hemmingway also sees himself as the fish that is putting up this fight with such great dignity. Life seems to be draining from him in his fight against an unknown foe. A foe that he can not get his understanding around. Ernest would be dead in less than ten years. There were references to Jesus in the book and Santiago even had a picture of the Sacred Heart of Jesus in his room but it was his wife's. He prayed some prayers in his boat. I think his faith was an intellectual ascent...his relationship with Jesus was much like his with Joe Dimaggio. He may have admired him but did not have much interaction with him on a daily basis. It had not penetrated the reality into being personal. It was a dormant volcano. Thanks, friend, for stopping by and making these comments. They are worth pondering. I know that this this thread is sort of passe, and I don't even know how I ended up on this board, but the Christ allusions are certainly intentional. The fact that Santiago fell exactly five times while carrying the mast, the image of Manolin behind him with the gaff as the Roman soldier, the specific allusion to Christ's wounds "the sound a man might make as nails are driven through his hands", and the repeated usage of the number three are too specific to be purely coincidental. Hemingway wasn't religious, but it's possible that he was manifesting himself in the form of Santiago, using Santiago's ordeal as an allegory for his writing career. He was widely lauded until the release of the work which directly preceded Old Man and the Sea, Across the River and Into the Trees. This met harsh criticism, and it could be said that he was "crucified" for it. There is a lot more evidence to support the Christ/Santiago comparison, but I think that that's a sufficient case for its presence in the novella, and a sufficient explanation for Hemingway's usage of it. Its absolutley amazing if you reread this novella how much information you can find that show the Christian imagery that Hemingway used. Great observation of the 5 times he falls and the agony that Santiago goes through similar to the walk to Calvary. Incredible amount of information almost in every paragraph he writes there is more symbolism. Also the three days that he was out at see and then comes back with the fish or " new hope" for the village fisherman as Jesus did when he rose on the third day to save humanity. Pretty sweet if you ask me. i think the boy symbolizes a deciple in the story. I read this book in my english class and my teacher said the same thing, but this helped me better nmy understanding. The christ Imagery was intentional all of it is meant to represent somthing of great importance to come. And no one can deny its there intentionaly because there are too many reasonable instances where christ imagery could be aplied ex: santiago's cuts in his hands represent christ nails in his hands... the cuts he got on his back represent jesus' marks from whipping...Santiago carries the mast over his shoulders..christ carried the cross over his shoulders...and when santiago dies he dies arms outstreched and palms up. Now tell me yhat is not christ imagery. EVANGELICAL THOUGHT-POLICE: IS IT A NEW GIFT? "Father, forgive them; they don't know...."